Avast: How to schedule boot time scan before window start? Avast anti virus provide schedule boot scan before window start. if your PC got infected by virus, try to run a schedule boot scan before window start. This is to make sure the virus can’t load itself into the system memory while window start. For normal infected file select “Move infected files to Chest” and select “No action” for system files and Press “Schedule” button. Avast will prompt you for restart to perform the Boot time scan and click “Yes” to reboot and start the scan. Instead of pressing move to chest, i rather pressed delete all and it has made my laptop not to boot. What should do pls i need help. I am not allowed to have a Scheduled Boot-time Scan despite the fact that I just performed a Quick Scan of My Entire Computer. Please don’t tell me that I need to have a Thorough Full-Disk Scan of My Entire Computer because that simply takes too long. What does this all mean? What steps should I take? i just instal avast anti virus, when i restart my pc, i can’t enter the windows, then out message that the instalation of avast anti virus was failure, how can i fix it if i cant enter the windows? try to look for the virus chest. if you cant get any files there then i’m sorry. I have done avast boot time scan on my laptop as selecting “2. delete all ” option. After that window start but this will not show me all my folders on disk, programs like nokia pc suite, .net framework, web browsers not working on my laptop. when i check my drive size it shows me acurate size that it aquires. During boot time scan i delete many files having the .exe and .scr files. So plz tail me how to get my folder view. Avast indicated it detected a threat, caught it before any damage could be done. It suggested rebooting so it could perform a boot time scan. When the system comes up (old dell inspiron), i see the Dell splash screen then the screen goes black with a flashing cursor. I have a 1 GB hard drive as a system disk. The system progresses past the black screen (after running for 5 hours). It also will not boot into safe mode. How do i get my system to boot? Is it normal or my comp is infected? did avast detect any viruses during the boot scan? If yes then it might caused by the virus removal. thnx man i own you !!!!!!!! Look ain avast website, schedual bootscan is grayed out, this function does not wok with vista 64x. u mean u can’t install antivirus into your system? try to boot your window in Safe Mode and install the Anti Virus. 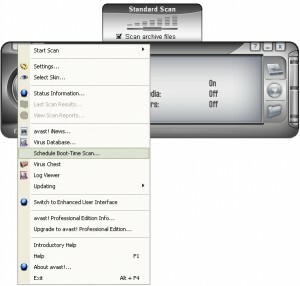 Scheduling Boot Time Scan in Avast requires Administrative rights. 1. Find Avast in your “Start Programs” menu. 2. Right-click on it and choose “Run as Administrator”, continue with step #3 above.